Miklós Boskovits (1935–2011), “Tuscan 13th Century/Madonna and Child with Saint John the Baptist, Saint Peter, and Two Angels/c. 1290,” Italian Paintings of the Thirteenth and Fourteenth Centuries, NGA Online Editions, https://purl.org/nga/collection/artobject/41675 (accessed April 25, 2019). This small painting is less than 10 inches across, and it was surely made for the private devotions of the person who owned it. That the owner was of modest means is suggested not only by the painting’s size but also by the limited use of gilding. The area of the gold background is relatively small, and the frame, which is carved from the panel, is not gilded at all. Instead, it is painted red and bears a simple decoration of daisies linked in a chain. Daisies were sometimes symbolic of the blessed souls in heaven or of Christ’s Incarnation. The painting’s execution is quick, even cursory. The artist, whose identity remains unknown, has used a shorthand technique for rendering the mouths of the Virgin and the blessing Christ, as well as the subsidiary figures, using only dark lines at the corners. The folds of Jesus’s robe have an almost metallic angularity. Nevertheless, the Virgin’s eyes convey wistfulness as she considers the future of her son, whom she presents to the spectator; and the wildness of John the Baptist, on the left, is lively and direct. The artist probably trained in the orbit of Cimabue, who softened the abstraction and stylization inherited from Byzantine art. 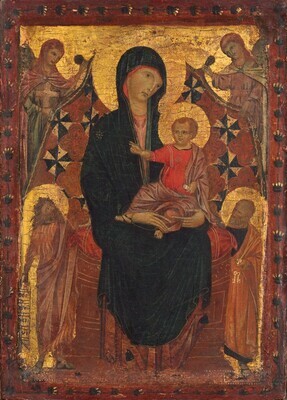 The composition is a variant of the type of the Hodegetria Virgin, a type that originated in Byzantium and is found in many of the Gallery's Madonnas of this period (the Byzantine Enthroned Madonna and Child and Lippo Memmi’s Madonna and Child with Donor are just two). The Virgin, “She Who Points the Way,” does not point towards her Son as “the Way,” as in the Byzantine prototype. In presenting him to the viewer instead, her affectionate maternal role has priority over her more impersonal function within the Church. That, at any rate, is how I think Mary’s gesture should be interpreted. On the significance of the pose of crossed legs in medieval iconography, cf. Johan Jakob Tikkanen, Die Beinstellungen in der Kunstgeschichte: Ein Beitrag zur Geschichte der künstlerischen Motive (Helsingfors, 1912), 153, while François Garnier, Le langage de l’image au Moyen Age, vol. 2, Grammaire des gestes (Paris, 1989), 158–159, added that “cette attitude est par excellence celle des personagges qui remplit les fonctions du Juge” (this is a pose par excellence of people who perform the duties of a judge). It seems to me that the flowers cursorily painted on the frame can be identified as daisies or marguerites (leucanthemum vulgare), symbols, according to Mirella Levi D’Ancona, of the “blessed souls in heaven” as well as of the “incarnation of Christ.” See Mirella Levi D’Ancona, The Garden of the Renaissance: Botanical Symbolism in Italian Painting (Florence, 1977), 124–126. The decoration of the frame discussed here vaguely recalls that of the panel with Saint Catherine and stories of her legend, no. 1583 in the Museo Nazionale in Pisa; cf. Lorenzo Carletti, in Cimabue a Pisa: La pittura pisana del Duecento da Giunta a Giotto, ed. Mariagiulia Burresi and Antonino Caleca (Pisa, 2005), 193. Antonino Caleca (1986) placed in doubt Vasari’s claim that Gaddo was the master of the mosaic of the Coronation in the Florentine Duomo. He argues that the execution of the mosaic should be given instead to Francesco da Pisa, documented author of the Christ in Majesty in the apse of Pisa Cathedral. See Antonio Caleca, “Pittura del Duecento e del Trecento a Pisa e a Lucca,” in La Pittura in Italia: Il Duecento e il Trecento, ed. Enrico Castelnuovo, 2 vols. (Milan, 1986), 1:243; and Antonio Caleca, “Francesco da Pisa,” in La Pittura in Italia: Il Duecento e il Trecento, ed. Enrico Castelnuovo, 2 vols. (Milan, 1986), 2:570. For my part, ever since 1984, I have observed that the Coronation of the Virgin reveals features a good deal more archaic than the most advanced artistic tendencies in Florence at the close of thirteenth century and have conjectured that the work originally was intended for a site other than Arnolfo di Cambio’s Duomo. Miklós Boskovits, A Critical and Historical Corpus of Florentine Painting: The Fourteenth Century, sec. 3, vol. 9, The Miniaturist Tendency (Florence, 1984), 18–19 n. 31. Later (1993), I expressed my readiness to accept the proposal of Monica Bietti (1983), who identified with Gaddo Gaddi the artist whose oeuvre had been reconstructed under the conventional name of the Master of Saint Cecilia. See Miklós Boskovits, A Critical and Historical Corpus of Florentine Painting: The Fourteenth Century, sec. 3, vol. 9, The Miniaturist Tendency (Florence, 1984), 18–19 n. 31; Miklós Boskovits, A Critical and Historical Corpus of Florentine Painting, sec. 1, vol. 1, The Origins of Florentine Painting, 1100–1270 (Florence, 1993), 143 n. 314; Monica Bietti, “Gaddo Gaddi: un’ipotesi,” Arte cristiana 71 (1983): 49–52. For their part, Annamaria Giusti (1994) and Luciano Bellosi (1998) accepted, at least as a working hypothesis, Gaddo’s authorship of the Coronation mosaic but denied that the mosaicist had any hand in the panel paintings attributed to him; cf. Annamaria Giusti, “I mosaici dei coretti, dei parapetti del matroneo, e del tamburo della cupola,” in Il Battistero di San Giovanni a Firenze, ed. Antonio Paolucci, 2 vols. (Modena, 1994), 1:325, 327 et passim; Luciano Bellosi, Cimabue, ed. Giovanna Ragionieri (Milan, 1998), 129, 137. For a discussion of the Gaddo = St. Cecilia Master hypothesis, see Miklós Boskovits, “Un nome per il maestro del Trittico Horne,” Saggi e memorie di storia dell’arte 27 (2003): 57–70. The attribution to Francesco Pisano has been reproposed in recent times by Mariagiulia Burresi and Antonino Caleca, “Pittura a Pisa da Giunto a Giotto,” in Cimabue a Pisa: La pittura pisana del Duecento da Giunta a Giotto, ed. Mariagiulia Burresi and Antonino Caleca (Pisa, 2005), 82–84, whereas the present writer gives the Coronation to the author of part of the mosaics of the dome of the baptistery, called the “Penultimate Master,” in Miklós Boskovits, A Critical and Historical Corpus of Florentine Painting, sec. 1, vol. 2, The Mosaics of the Baptistery of Florence (Florence, 2007), 591–594. The attribution of the work to Gaddo Gaddi was based on a tradition handed down by Vasari, according to whom this master was responsible for the mosaic of the Coronation of the Virgin on the inner façade of the cathedral of Santa Maria del Fiore in Florence. The authenticity of this tradition was accepted down to recent times, until art historians gradually began to perceive that the figurative style of the mosaic appears not to have been that of an artist of the generation of Giotto (Florentine, c. 1265 - 1337), as Gaddo Gaddi would have been, according to the evidence of documents, but that of a somewhat older master. In recent times, in fact, the identification of Gaddo with the Giottesque Master of Saint Cecilia has been proposed, while the Coronation of the Virgin on the inner façade of the Duomo has been either cited with the traditional attribution or attributed to Francesco Pisano, an artist belonging to Cimabue’s generation, or given to the so-called Penultimate Master of the mosaics in the baptistery in Florence. For a broad discussion of the chronology of this decorative enterprise, cf. Luciano Bellosi, Cimabue, ed. Giovanna Ragionieri (Milan, 1998), 162–182, 278–281. The Pisan provenance of the panel, small and easily transportable, does not imply that it was executed in that city. The master who painted it must have been trained under the influence of Cimabue, and probably at the time of his fresco decoration of the upper church of San Francesco in Assisi. In particular some figures of angels that populate the right transept of that church, with their tense, frowning faces and ruffled garments, suggest that the execution of the panel in the National Gallery of Art should be placed around 1290. Church of San Francesco, Pisa; Carlo Lasinio [1759-1838], Pisa; possibly Francis Douce [1757-1834], London, by 1829; Mrs. Fanshaw; (sale, Christie & Manson, London, 21 March 1835, no. 80). (country sale, Patterdale Hall, Ullswater, near Penrith, Cumbria, 8 August 1934); (P. & D. Colnaghi & Co., London); sold 8 April 1935 to (Gualtiero Volterra, Florence); (Count Alessandro Contini-Bonaccossi, Florence), by 1935; sold 1948 to the Samuel H. Kress Foundation, New York; gift 1952 to NGA. Donata Levi ("Carlo Lasinio, curator, collector and dealer," The Burlington Magazine 135 (1993): 133-148) points out that in 1829 Lasinio offered Francis Douce a series of paintings, illustrated with a sketch representing fourteen panels of Italian masters. The last of these, reproduced at the bottom right of the sheet (Oxford, Bodleian Library, Ms Douce d 57, fol. 84; fig. 86 in Levi’s article), is identified with the caption “Madonna di Cimabue / 1200”, but unfortunately in this case Lasinio failed to provide any sketch of the composition. Dillian Gordon (National Gallery Catalogues. 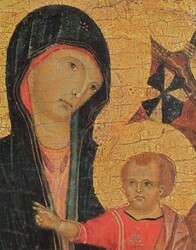 The Fifteenth Century Italian Paintings, London, 2003: 32-36) has identified the panel that Lasinio attributed to Cimabue, which together with the others was presumably sold to Douce in 1830, with a small painting, a genuine work of Cimabue acquired by the National Gallery in London (inv. 6583). Gordon’s proposal is, of course, a hypothesis based on the small dimensions of the work and Lasinio’s attribution to the Florentine artist. There is, however, no evidence that the London painting was ever in Lasinio’s collection and, in any case, as the same scholar remarks, “the small label on the back (£ 6.15.4’) strongly suggests that it was acquired in England.” Thus, the alternative identification of Lasinio's "Cimabue" with the NGA panel also may be hypothesized. In his letter of 16 May 1963 to John Walker (in NGA curatorial files), James Byam Shaw states that Mayer, his former partner in the Colnaghi firm, had purchased the painting “at a country sale” on 8 August 1934, and then he himself resold it on 8 April of the following year “to Volterra the Italian dealer”, clearly a reference to Gualtiero Volterra, Contini-Bonaccossi's agent in London. As was his habit, Contini-Bonaccossi sought advice about the painting he had acquired by consulting the most highly respected experts of Italian painting of the day. Of these, Wilhelm Suida's and Giuseppe Fiocco's opinions (copies in NGA curatorial files) are dated August 1935 and were written in Florence, where the painting evidently was located at that time. The painting was eventually taken to New York and is one of twenty-eight works listed in the purchase offer addressed to the count by the Kress Foundation on 7 June 1948, and accepted by him on 11 July 1948 (copies in NGA curatorial files). Application of restoration paint to areas of lost original paint to visually integrate an area of loss with the color and pattern of the original, without covering any original paint. passages are especially evident in the cloth of honor and in the Virgin’s cloak, as well as in the left side of the right-hand angel’s face, the left side of Saint Peter’s face, and the child’s hair. The figures’ eyes and mouths have been reinforced. Inpainting also is evident in the frame, especially in the lower left and upper right corners. Coletti, Luigi. I Primitivi. 3 vols. Novara, 1941-1947: 1(1941):33-34. Longhi, Roberto. "Giudizio sul Duecento." Proporzioni 2 (1948): 16, 45, pls. 19-20. Garrison, Edward B. Italian Romanesque Panel Painting: An Illustrated Index. Florence, 1949: 18, 100 (no. 251 A), repro. Salvini, Roberto. "Postilla a Cimabue." Rivista d’arte 26 (1950): 54. Brandi, Cesare. Duccio. Florence, 1951: 135 n. 13. Galetti, Ugo, and Ettore Camesasca. Enciclopedia della pittura italiana. 3 vols. Milan, 1951: 1:672. Volpe, Carlo. "Preistoria di Duccio." Paragone 5, no. 49 (1954): 18. Ragghianti, Carlo Ludovico. Pittura del Dugento a Firenze. Florence, 1955: 124, 127, fig. 191. Paintings and Sculpture from the Kress Collection Acquired by the Samuel H. Kress Foundation 1951-56. Introduction by John Walker, text by William E. Suida and Fern Rusk Shapley. National Gallery of Art. Washington, 1956: 50, no. 16, repro., as by Cimabue. Samek Ludovici, Sergio. Cimabue. Milan, 1956: 24, 32, pls. 8-9. Salvini, Roberto. "Cimabue." In Enciclopedia Universale dell’Arte. Edited by Istituto per la collaborazione culturale. 15 vols. Florence, 1958-1967: 3(1960):472. Paintings and Sculpture from the Samuel H. Kress Collection. National Gallery of Art, Washington, 1959: 15, repro., as by Cimabue. Bologna, Ferdinando. "Un capolavoro giovanile di Duccio." Paragone 11, no. 125 (1960): 9-10, 25 n. 7, 27 n. 16. Battisti, Eugenio. Cimabue. Milan, 1963: 109, fig. 35. Berenson, Bernard. Italian Pictures of the Renaissance. Florentine School. 2 vols. London, 1963: 1:50. Michener, James A. “Four Miracles—And A Masterpiece.” Reader’s Digest 89 (November 1966): 164. Shapley, Fern Rusk. Paintings from the Samuel H. Kress Collection: Italian Schools, XIII-XV Century. London, 1966: 5-6, fig. 9. Fredericksen, Burton B., and Federico Zeri. Census of Pre-Nineteenth Century Italian Paintings in North American Public Collections. Cambridge, Mass., 1972: 54, 311, 410, 646, 665. European Paintings: An Illustrated Summary Catalogue. National Gallery of Art, Washington, 1975: 70, repro. Sindona, Enio. L’opera completa di Cimabue e il momento figurativo pregiottesco. Milan, 1975: 117, 118, fig. 49. Boskovits, Miklós. Cimabue e i precursori di Giotto: affreschi, mosaici e tavole. Florence, 1976: n.p. , no. 22. Shapley, Fern Rusk. Catalogue of the Italian Paintings. National Gallery of Art. 2 vols. Washington, 1979: I:133-134; 2:pl. 93. Lygon, Dorothy, and Russell Francis. "Tuscan Primitives in London Sales: 1801-1837." The Burlington Magazine 122 (1980): 113, 116. European Paintings: An Illustrated Catalogue. National Gallery of Art, Washington, 1985: 89, repro. Tartuferi, Angelo. "Pittura fiorentina del Duecento." In La Pittura in Italia. Le origini. Edited by Enrico Castelnuovo. Milan, 1985: 236, 240 n. 43. Tartuferi, Angelo. "Pittura fiorentina del Duecento." In La Pittura in Italia. Il Duecento e il Trecento. Edited by Enrico Castelnuovo. 2 vols. Milan, 1986: 1:278, 282 n. 41. Marques, Luiz. La peinture du Duecento en Italie centrale. Paris, 1987: 5, 107, 135, 244 n. 173, 282, pl. C.
Tartuferi, Angelo. "Un libro e alcune considerazioni sulla pittura del Duecento in Italia centrale." Arte cristiana 76 (1988): 434, 440 n. 26. Grabski, Józef, ed. Opus Sacrum: Catalogue of the Exhibition from the Collection of Barbara Piasecka Johnson. Exh. cat. Zamek Królewski, Warsaw, 1990. Vienna, 1990: 30. Tartuferi, Angelo. La pittura a Firenze nel Duecento. Florence, 1990: 47, 49, 57 no. 56, fig. 180. Hall, Nicholas H. J., ed. Colnaghi in America: A Survey to Commemorate the First Decade of Colnaghi, New York. New York, 1992: 134. Tartuferi, Angelo. "Cimabue." In Allgemeines Künstlerlexikon: Die bildenden Künstler aller Zeiten und Völker. Edited by Günter Meissner. 87+ vols. Munich and Leipzig, 1992+: 19(1998):223. Levi, Donata. "Carlo Lasinio, Curator, Collector and Dealer." The Burlington Magazine 135 (1993): 147. Carli, Enzo. La pittura a Pisa dalle origini alla Bella Maniera. Pisa, 1994: 23. Ciatti, Marco, and Cecilia Frosinini, eds. La Madonna di San Giorgio alla Costa di Giotto: studi e restauro. Problemi di conservazione e restauro 3. Florence, 1995: 36. Bellosi, Luciano. Cimabue. Edited by Giovanna Ragionieri. 1st ed. Milan, 1998: 163-164, 241 n. 41, 251, 267, 289. Labriola, Ada. "Gaddi, Gaddo." In Dizionario biografico degli italiani. Edited by Alberto Maria Ghisalberti. 82+ vols. Rome, 1960+: 51(1998):155. Labriola, Ada. "Lo stato degli studi su Cimabue e un libro recente." Arte cristiana 88 (2000): 344. Giorgi, Silvia. "Azzo di Mazzetto." In La pittura in Europa. Il Dizionario dei pittori. Edited by Carlo Pirovano. 3 vols. Milan, 2002: 1:39. Boskovits, Miklós, and Angelo Tartuferi, eds. Dipinti. Vol. 1, Dal Duecento a Giovanni da Milano. Catalogue of the Galleria dell'Accademia, Florence.1st ed. Florence, 2003: 227. Tartuferi, Angelo, and Mario Scalini, eds. L’arte a Firenze nell’età di Dante (1250-1300). Exh. cat. Galleria dell’Accademia, Florence, 2004: 116. Wollesen, Jens T. Hasten to My Aid and Counsel: The Answers of the Pictures. Private Devotional Panel Painting in Italy around 1300. New York, 2005: 87-88, 182-183, 257 fig. 61. Flora, Holly. Cimabue and Early Italian Devotional Painting. New York, 2006: 38 n. 89. Morozzi, Luisa. "Da Lasinio a Sterbini: ‘primitivi’ in una raccolta romana di secondo Ottocento." In AEIMNEΣTOΣ. Miscellanea di studi per Mauro Cristofani. 2 vols. Edited by Benedetta Adembri. Florence, 2006: 2:915 n. 30. Boskovits, Miklós. A Critical and Historical Corpus of Florentine Painting. Sec. I, Vol. II: The Mosaics of the Baptistery of Florence. Florence, 2007: 214 n. 174. Boskovits, Miklós. Italian Paintings of the Thirteenth and Fourteenth Centuries. The Systematic Catalogue of the National Gallery of Art. Washington, 2016: 378-384, color repro. Evelyn Sandberg-­Vavalà, L’iconografia della Madonna col bambino nella pittura italiana del Dugento (Siena, 1934), 45–48, classified this subtype as the “seconda modificazione del tipo Odigitria” (second modification of the Hodegetria type). On the iconography of the Hodegetria (a term translatable as “indicator of the way”), cf. the exhaustive treatment by Gregor Martin Lechner, “Maria,” in Reallexikon zur byzantinischen Kunst, ed. Klaus Wessel, 7 vols. (Stuttgart, 2005), 6:58–71. The variants of the protagonists’ poses in this iconographic type are understood as attempts to augment the realistic effect of the image, i.e., expressions of vivacity and of the affection between mother and child. In a study on the types of thrones in thirteenth-century paintings, James Stubblebine (1954–1957) distinguished four types, of which the third, exemplified by such works as Guido da Siena’s Maestà in San Domenico in Siena and Duccio’s Madonna Rucellai, commissioned in 1285 and now in the Uffizi, Florence, is a structure conceived as a “three-dimensional block” and represented so that “the front and back are parallel to the picture plane, while the sides run diagonally.” This typology common to paintings dating to the last quarter of the Duecento naturally implies some indication of the chronological position of the panel discussed here. See James H. Stubblebine, “The Development of the Throne in Dugento Tuscan Painting,” Marsyas 7 (1954–1957): 25–39. Copies of the expertises by Roberto Longhi, Evelyn Sandberg-­Vavalà, Wilhelm Suida, Raimond van Marle, and Adolfo Venturi are preserved in the NGA curatorial files: they were unanimous in confirming the authorship of Cimabue for the painting. Of these experts, only Longhi provided a chronological indication, maintaining that the panel must antedate Cimabue’s Madonna (no. 8343) now in the Uffizi, Florence. “La Madonna come un falchetto inciprignito,” Roberto Longhi wrote in 1948, “ il Bambino con aria di censore prepotente​ . . . ​gli angeli che impugnano, quasi manovelle di timone, le cocche del drappo​ . . . ​i due santi collerici​ . . . ​che sbuffano ai lati del trono. In un tema puramente sacramentale ce n’è abbastanza per alludere ai drammi imminenti del transetto di Assisi” (The Madonna like an irritated bird of prey, the child with the air of an overbearing censor, the angels who grab the corners of the cloth like the handle of a boat’s tiller, the two irascible saints snorting at the sides of the throne. In a purely sacramental theme there is enough to foreshadow the imminent drama of the transept at Assisi). Longhi referred, of course, to the frescoes in the upper church of San Francesco in Assisi, which he dated to the years between the end of the eighth and the first half of the ninth decade of the thirteenth century. See Roberto Longhi, “Giudizio sul Duecento,” Proporzioni 2 (1948): 16. Luigi Coletti, I Primitivi, vol. 1, 120 tavole (Novara, 1941), 33–34. Supporting Cimabue’s authorship were Ugo Galetti and Ettore Camesasca, Enciclopedia della pittura italiana, 3 vols. (Milan, 1951), 1:672; Ferdinando Bologna, “Un capola­voro giovanile di Duccio,” Paragone 11, no. 125 (1960): 9–10, who proposed its execution before 1280; Luiz Marques, La peinture du Duecento en Italie centrale (Paris, 1987), 282, who thought that the panel was painted c. 1270–1275; Adam S. Labuda, in Opus sacrum: Catalogue of the Exhibition from the Collection of Barbara Piasecka Johnson, ed. Józef Grabski (Vienna, 1990), 30; Nicholas H. J. Hall, ed., Colnaghi in America: A Survey to Commemorate the First Decade of Colnaghi, New York (New York, 1992), 134; and Enzo Carli, La pittura a Pisa dalle origini alla Bella Maniera (Pisa, 1994), 23, who placed its execution after the Maestà in the Louvre, Paris, a work that, like the Washington Madonna, also comes from the church of San Francesco in Pisa. The painting was classified as “attributed to Cimabue” in National Gallery of Art, Paintings and Sculpture from the Kress Collection (Washington, DC, 1956), 50–51; National Gallery of Art, Summary Catalogue of European Paintings and Sculpture (Washington, DC, 1965), 28; Fern Rusk Shapley, Paintings from the Samuel H. Kress Collection: Italian Schools, XIII–XV Century (London, 1966), 5–6; Fern Rusk Shapley, Catalogue of the Italian Paintings, 2 vols. (Washington, DC, 1979), 1:133–134; Dorothy Lygon and Russell Francis, “Tuscan Primitives in London Sales: 1801–1837,” The Burlington Magazine 122 (1980): 113, 116; and National Gallery of Art, European Paintings: An Illustrated Catalogue (Washington, DC, 1985), 89. Scholars who doubted the attribution, although without formulating any alternative proposals, include Sergio Samek Ludovici, Cimabue (Milan, 1956), 24, 32; Roberto Salvini, “Cimabue,” in Enciclopedia Universale dell’Arte, ed. Istituto per la collaborazione culturale, 15 vols. (Florence, 1958–1967), 3 (1960): 472; Miklós Boskovits, “Cenni di Pepe (Pepo), detto Cimabue,” in Dizionario biografico degli italiani (Rome, 1979), 23: 542; and Angelo Tartuferi, “Un libro e alcune considerazioni sulla pittura del Duecento in Italia centrale,” Arte cristiana 76 (1988): 434, 440 n. 26. Those who believed that it was produced in the artist’s workshop or by his immediate following include John Pope-­Hennessy, “Review of Proporzioni ii by Roberto Longhi,” The Burlington Magazine 90 (1948): 360; Bernard Berenson, Italian Pictures of the Renaissance: Florentine School, 2 vols. (London, 1963), 1:50; Burton B. Fredericksen and Federico Zeri, Census of Pre-­Nineteenth-­Century Italian Paintings in North American Public Collections (Cambridge, MA, 1972), 54. The painting was defined as the work of an anonymous late thirteenth-century Florentine master by Edward B. Garrison, Italian Romanesque Panel Painting: An Illustrated Index (Florence, 1949), 18, 100; Cesare Brandi, Duccio (Florence, 1951), 135 n. 13; Carlo Volpe, “Preistoria di Duccio,” Paragone 5, no. 49 (1954): 18; Carlo Ludovico Ragghianti, Pittura del Dugento a Firenze (Florence, 1955), 124, 127; Enio Sindona, L’opera completa di Cimabue e il momento figurativo pregiottesco (Milan, 1975), 117, 118; and Angelo Tartuferi, “Pittura fiorentina del Duecento,” in La Pittura in Italia: Le origini, ed. Enrico Castelnuovo (Milan, 1985), 236, 240 n. 43. Roberto Salvini, “Postilla a Cimabue,” Rivista d’arte 26 (1950): 54; and Enzo Carli, Pittura medievale pisana (Milan, 1958), 64, thought it the work of an anonymous Pisan master. Also, Jens T. Wollesen, Hasten to My Aid and Counsel: The Answers of the Pictures; Private Devotional Panel Painting in Italy around 1300 (New York, 2005), 87–88, 182–183, classified is as Cimabuesque, of c. 1250–1300. Miklós Boskovits, Cimabue e i precursori di Giotto: Affreschi, mosaici e tavole (Florence, 1976), n.p. , no. 22, pointed out that the style of the Gallery's panel was close to that of the group of works he himself had referred to Gaddo Gaddi. His reconstruction of Gaddo’s oeuvre consisted of the fragmentary Madonna in the church of San Remigio in Florence; the crucifix no. 1345 in the Galleria dell’Accademia in Florence; another painted crucifix in the church of Santo Stefano a Paterno (Bagno a Ripoli, Florence); and a small portable cross in the Fogg Art Museum in Cambridge, Massachusetts (no. 1929.250), in addition to the mosaic of the Coronation of the Virgin on the inner façade of the Duomo in Florence. Vasari cited the latter as a work by Gaddo Gaddi in his vita of that master, together with part of the mosaic on the façade of Santa Maria Maggiore in Rome (in general ascribed by the art historical literature to Filippo Rusuti); the mosaic Assumption in the apse of the transept of Pisa Cathedral, in actual fact executed on the basis of a design by Simone Martini (Sienese, active from 1315; died 1344); and some other works, which today appear stylistically incongruous or are lost. See Giorgio Vasari, Le vite dei più eccellenti pittori, scultori ed architettori, ed. Gaetano Milanesi, 9 vols. (Florence, 1878–1885), 1(1878):346–347. In more recent times, Marco Ciatti and Cecelia Frosinini (1993) and Ada Labriola (1998) cited the panel now in the National Gallery of Art as a work by Gaddi. Cf. Marco Ciatti and Cecilia Frosinini, ed., La Madonna di San Giorgio alla Costa di Giotto: Studi e restauro, Problemi di conservazione e restauro (Florence, 1995), 36; Ada Labriola, “Gaddi, Gaddo,” in Dizionario biografico degli italiani (Rome, 1998), 51:155. Accepting Alessandro Bagnoli’s suggestion, Luciano Bellosi, Cimabue, ed. Giovanna Ragionieri (Milan, 1998), 267, thought that the master of the frescoes of the “Sala di Dante” in the Palazzo Pubblico of San Gimignano might be identified with Azzo di Mazzetto, an artist documented in Florence in 1282. He attributed to the same hand a painted crucifix in the Museo Civico in San Gimignano and the present panel of the National Gallery of Art. Silvia Giorgi accepted this proposal in “Azzo di Mazzetto,” in La pittura in Europa: Il dizionario dei pittori, ed. Carlo Pirovano, 3 vols. (Milan, 2002), 1:39, and it was cited without comment by Ada Labriola, “Lo stato degli studi su Cimabue e un libro recente,” Arte cristiana 88 (2000): 344; and Sonia Chiodo, “Attorno a un dipinto inedito di Ambrogio Lorenzetti,” Arte cristiana 91 (2003): 1–6. Cf. Pio Rajna, “Pittura e pittori a San Gimignano intorno all’anno 1300,” Miscellanea storica della Valdelsa 18 (1920): 1–13. Roberto Longhi, “Giudizio sul Duecento,” Proporzioni 2 (1948): 16. Miklós Boskovits, “Da Duccio a Simone Martini,” in Medioevo: La chiesa e il palazzo; Atti del convegno internazionale di studi, Parma, September 20–24, 2005, ed. Arturo Carlo Quintavalle (Milan, 2007), 566–569. See Fern Rusk Shapley, Catalogue of the Italian Paintings, 2 vols. (Washington, DC, 1979), 1:133–134 n. 7. Several layers of inpainting are visible under ultraviolet light. Pelliccioli’s restoration followed the acquisition of the panel by Contini-­Bonacossi. Presumably, Pichetto did not remove Pelliccioli’s inpainting before adding his own in 1948.